Electus Recruitment Solutions has a proven track record within the engineering and technical recruitment sector since 2003. Placing highly skilled professionals in job roles within the Aerospace, Defence, Infrastructure and Energy industries, we offer permanent and contractual recruitment services for UK and internationally renowned businesses. Our talent delivery consultants have built a solid reputation with many high profile clients including manufacturers, consultancies and prime contractors placing hundreds of candidates per year. 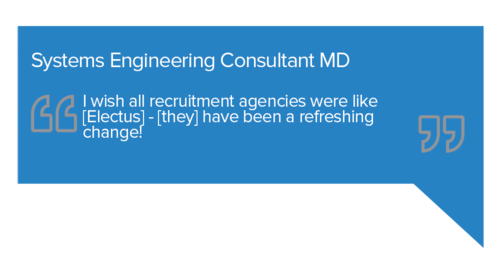 Electus are your ‘go to’ specialist technical & engineering recruiters. 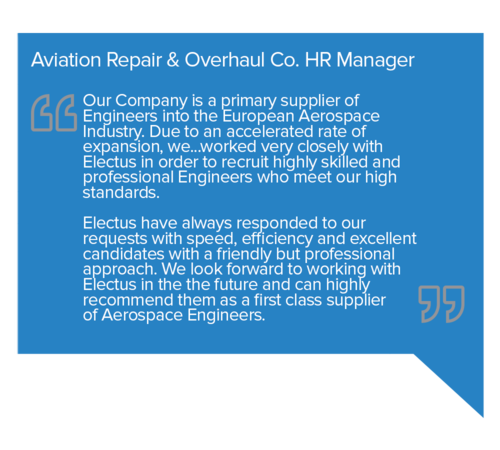 Electus Recruitment has been recruiting candidates for Aerospace Engineer jobs since 2003, a respected provider of contract and permanent technical talent for the UK and international businesses. Aerospace engineering is the primary branch of engineering concerned with the research, design, development, construction and technology of aircraft and spacecraft. The field also covers aerodynamic characteristics and behaviours, airfoil, control surfaces, lift, drag, and other properties. Electus Recruitment has been recruiting candidates for Defence jobs since 2003. As a provider of contract and permanent technical talent across the UK including Bournemouth, Bristol, Bath, Warwick and London, our clients include the MOD, prime contractors, consultancies, component vendors and system integrators. Our Talent Delivery Consultants are experts in sourcing candidates specialising in land, marine, air, weapons, electronics, communications, avionics and cyber security domains. Our knowledge of specialist technical recruitment is extensive, with the emergence of the UK digital economy and the challenges faced by businesses to secure the best talent for job vacancies, Electus Technology & Digital (T&D) was born. Working in partnership with companies throughout the UK and beyond, we support Technology Vendors offering Cloud and Software based services across the Business Management, Marketing Technology, Financial Technology, Big Data, Customer Relationship and Talent Management sectors. The use of data is changing within business. More data is being collected than ever before and technology development is advancing faster than in any other digital domain. With the emergence of Artificial Intelligence (AI) and Machine Learning technologies to add to the mix, it is essential that companies no matter the size have access to the best technical and analytical talent in the field. This is where the Electus Technology & Digital (T&D) team come into their own, sourcing candidates using insider knowledge and matching their skills to job opportunities within an efficient timeframe. SaaS solutions are being adopted across all areas of business. New and developed technologies are working with companies to improve business processes and functions across the board. Business Management solutions are also being adopted for Operations, HR, IT, Finance and Marketing. Therefore it is essential for vendors within this market to secure the commercial and technical talent they need to compete in this innovative and growing market. This is where the Electus Technology & Digital (T&D) team come into their own, sourcing candidates using insider knowledge and matching their skills to job opportunities within an efficient timeframe. CRM solutions have seen a global uptake of late, they are changing the way businesses use the data they have about their customers and clients. There are a few global players with a large market share in the industry but the majority still belong to niche solutions and more and more enter the market every day. Therefore the need to attract highly skilled technical and commercial talent is a necessity for organisations of all sizes. This is where the Electus Technology & Digital (T&D) team come into their own, sourcing candidates using insider knowledge and matching their skills to job opportunities within an efficient timeframe. Electus Technology & Digital (T&D) work alongside agencies within the digital industry, an area that has seen continual growth as companies put emphasis achieving digital success. With ‘Digital Transformation’ becoming a priority across all sectors, the demand for consultancies to provide their service to businesses during this technological and strategic change are essential. This is where the Electus T&D team come into their own, sourcing candidates using insider knowledge and matching their skills to job opportunities within an efficient timeframe. Financial institutions have been heavily investing in Financial Technology (Fintech) Start-ups for last few years, with each area of financial management taking advantage of the new technologies available in order to provide more secure and customer centric financial solutions.As these businesses mature, there is an essential requirement to attract the right candidates at the right time in what is becoming one of the most competitive and exciting markets for tech and commercial talent. An early adopter of SaaS solutions, Marketing, Technology & eCommerce platforms are ever changing and innovating therefore companies require vast skill sets from their employees, more than ever before, to drive sales and marketing objectives. The Technology & Digital (T&D) division of Electus Recruitment serves a number of different specialist areas within the Martech landscape that support eCommerce, Sales and Marketing solutions right across the digital spectrum. Channeling our technical recruitment experience since 2003, Electus Cyber & Security (C&S) offers a specially tailored service to meet the real and growing demand for organisations of all sizes to protect their systems and employees from cyber-threats. We have dedicated consultants with a solid technical understanding of the Cyber disciplines, skills and market trends to ensure candidates fit both the technical requirements of the job role as well as the culture of the company. Organisations are putting an increased focus on data governance with a corresponding rise in jobs that relate to governance, risk management and compliance (GRC). Established in 2003, Electus is a leading recruitment specialist in the Engineering, Technology & Digital and Cyber & Security sectors. Placing thousands of skilled candidates in permanent and contract job roles, our talented recruiters are experts in their field. We work with a plethora of high calibre clients in the UK and internationally, providing results focussed, responsive recruitment solutions.